We were so blessed to attend our local "Run for One" event last night. Wonderful people came out to support Lifeline's ministry and specifically to rally for "Rafe," the little one we continue to advocate for. The Pounders family organized the entire thing and it was a huge success! You can read more about "Run for One" HERE. If you weren't able to join us last night but would still like to register, in order to support the work of Lifeline and receive a really cool t-shirt, you can click on "run where you are" and sign up. As I mentioned, last night's run was in honor of Rafe. This is an opportunity for me to share, again, who this amazing child is. 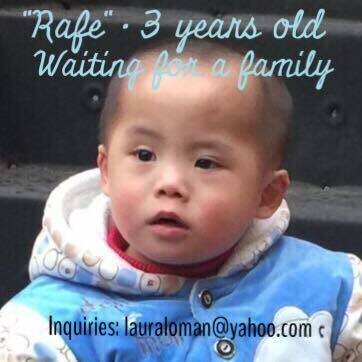 Rafe is a little boy who lives in an orphanage in China. He has no one to call "Mama" or "Baba." He was born with Down Syndrome and a congenital heart defect, left abandoned, and remains in this circumstance with little hope. The Lord put his precious face in front of us last year and has called us to be his voice. We pray for him often. We beg for a family to step out in faith. Until a loving home is a reality for Rafe, we trust that his little life is in his maker's hands. Please read about him HERE and share with anyone who may consider praying for or adopting this child of God. Because no family has chosen to pursue him, his file has returned to the shared list in China. There are many implications for this but notably that Lifeline no longer has his file and there is not a designated agency who can be a voice for him. We are, essentially, the only ones putting his face out there. His file sits with thousands of others, going unnoticed, the same way Fuyi's did. We can't stop posting about him. We can't stop praying for him. We can't stop telling the world that there's a dark truth about too many kids silently yelling for help. If you are interested in learning more about this child, please contact me. I have his medical file as well as some (adorable) recent videos of him. We have been asked why we aren't adopting Rafe. Why have we chosen another child to adopt? Our answer is not simple but we want to try to give some clarity on our decision. When Seamus and I knew we were being called to adopt again, we prayed many times over Rafe and the possibility of bringing him in to our fold. God made it very clear that His plan for Rafe was not one that included our home. It was the same message we received when hosting Fuyi. It was confusing because we adored her and truly fell in love with her. We knew she needed a family and we had one to offer, but we just knew Fuyi wasn't our daughter and that God had other plans for her. The same is true for Rafe. He needs a loving family. We have one. We are willing. But again, God is making it clear that He has other plans. We can't rely on God's plan being one to suit our desire... to find Rafe another family, the way He did for Fuyi. Nonetheless, we know God's plan is perfect, that His will is always better than ours and that His sovereignty over this child's life should never be doubted. So, we move forward. We begin a new journey to bring home our own child, a different child with Down syndrome and a sick heart, one who was also going unnoticed. But we never forget Rafe and what God has called us to, on his behalf. We continue to pray. We continue to advocate. We ask you, once more, to please consider the joy that would come from embracing this child.